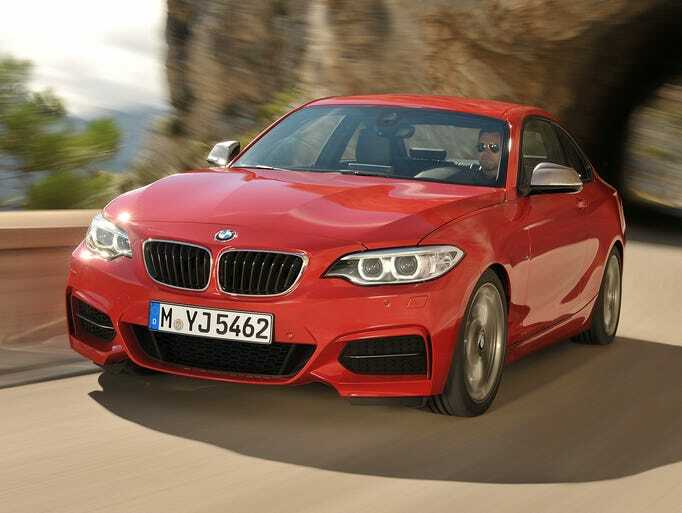 Consumer Reports will publish in its August issue (out July 1) surprising test results showing a relatively modest subcompact coupe outscoring a pair of sports car icons, Chevy’s flashy new Corvette Stingray and Porsche’s 911 Carrera S.
All were high scorers and it was close, but the BMW M235i coupe — the “M” performance version of the subcompact — tallied a 98 total score in CR testing vs. 96 for the Porsche and 92 for the Corvette. It also noted the BMW scored that high while having a sticker $23,000 less than the Stingray and $60,000 less than the 911. Another view from Aaron Bragman of Cars.com New BMW M235i bigger, faster and more fun, but disappointing lack of standard features quickly drives price up, desirability down. But the score was about performance not price and CR says its engineers found the new M235i — which replaced the 135 — “taught, quick, and eager”. They found its manners on the track “capable and poised, with tenacious cornering grip and balanced behavior.” And they noted that it posted a higher maximum speed in CR’s avoidance-maneuver course than the Stingray. “While the M235i doesn’t quite achieve the same acceleration and braking levels of the top performance cars, it’s offers just as much fun in a more refined package that you would be happy to drive everyday,.” said Jake Fisher, CR director of automotive testing. The engineers gave the 911 the edge in handling and smooth power delivery and noted a “commendable” at 23 mpg overall on a diet of premium. The Stingray impressed with 0-to-60 acceleration of 4.3 seconds, “fantastic brakes” and “quick reflexes.” CR found it lighter on its feet than older ‘Vettes, but also found “it’s still a wide car that’s ultimately more about power than grace, and the best place to explore its full potential is on a track.” It came in at 20 mpg overall in fuel efficiency. Which of the three will hold up better in a long-term relationship?